The award came at a key time in the capital punishment debate. Recently, Maryland Governor Martin O’Malley signed legislation ending the death penalty in his state, and other states are either considering the issue or have had recent votes fail. According to a recent report by Amnesty International, the number of U.S. executions in 2012 was identical to 2011, though only nine states carried executions compared with 13 in 2011. 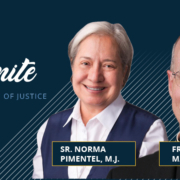 The Robert M. The Holstein award, a national recognition, annually honors individuals who have demonstrated a significant commitment to leadership for social justice grounded in his or her faith. The Ignatian Solidarity Network (ISN) is a national social justice education and advocacy organization inspired by the spirituality of St. Ignatius of Loyola, the founder of the Jesuit order of Catholic priests and brothers. ISN works primarily with individuals connected with Jesuit universities, high schools, parishes, and social ministries throughout the United States. Sr. Prejean began her prison ministry in 1981 when she dedicated her life to the poor of New Orleans. Since then, she has been committed to educating citizens about the death penalty and counseling individual death row prisoners. She has accompanied six men to their deaths. In 1994, Sr. Prejean turned her experiences into the book titled, Dead Man Walking: An Eyewitness Account of the Death Penalty, which was later developed into a major motion picture starring Susan Sarandon as Sr. Prejean and Sean Penn as a death row inmate. The movie received four Oscar nominations including Tim Robbins for Best Director, Sean Penn for Best Actor, Susan Sarandon for Best Actress, and Bruce Springsteen’s “Dead Man Walkin” for Best Song. Sr. Prejean’s second book, The Death of Innocents: An Eyewitness Account of Wrongful Executions, was published in December 2004 and describes her experiences of accompanying two men to their executions. She continues her work as a passionate storyteller on speaking tours throughout the U.S. and is presently working on her next book, River of Fire: My Spiritual Journey. Sr. Prejean is a religious sister of the Congregation of St. Joseph, a community of nearly 700 vowed women religious founded in 1650 in France. Sr. Prejean has spoken at nearly all twenty-eight Jesuit universities in the United States and received honorary degrees from eleven: Marquette University (2009), Regis University (2005), Loyola University New Orleans (2005), Spring Hill College (2003), Wheeling Jesuit University (2001), University of Scranton (2001), University of San Francisco (1999), College of the Holy Cross (1999), Gonzaga University (1998), and Georgetown University (1996). She has also received awards from Fordham University (2010), Jesuit Volunteer Corps (2006), John Carroll University (2004), and Loyola University Chicago (1996). Sr. Prejean initially connected with the Ignatian Solidarity Network by speaking to thousands of young people at their annual event, the Ignatian Family Teach-In for Justice in 2003. At that event she formally introduced the Dead Man Walking School Theater Project, and consequently Jesuit high schools were some of the first institutions in the U.S. to perform the play. The Holstein award’s namesake, the late Robert (Bob) M. Holstein, was a former California Province Jesuit priest, labor lawyer, fierce advocate for social justice, and one of the founders of the Ignatian Family Teach-In for Justice. Holstein died in 2003, but his family continues to support the work of ISN. 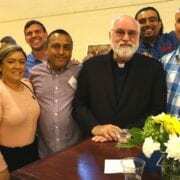 Supporters of this year’s event included the Ignatian Solidarity Network Board of Directors, Mr. and Mrs. Vince and Robyn Caponi, Mrs. Loretta Holstein (the widow of the late Bob Holstein), Mr. Salvador Colon, Very Rev. David Ciancimino, S.J. (Provincial, New York Province of the Society of Jesus), Very Rev. Mark Lewis, S.J. (Provincial, New Orleans Province of the Society of Jesus), Ms. Susan Sarandon (via the Susan Sarandon Foundation), Very Rev. Michael Weiler, S.J. (Provincial, California Province of the Society of Jesus), and the students of Xavier High School in New York City. Sr. Helen Prejean speaks with Fred Kammer, S.J.